You will receive all services from a single source - consulting, conception and implementation. For us service is a matter of course. Over 15 years, content customers and successful exhibitions. Elaborated fair stands which will inspire your clients. A professional interaction between creatives, architects and craftsmen - all made in Germany. 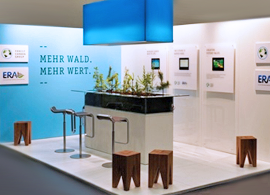 Over 100 ready-made exhibition stand concepts are waiting for you. Thereby you just don't save planning efforts but huge costs. Exhibition stands built with aluminium profiles - modularly expandable and easy setup. Minor planning efforts, small pack size and cost-effective. Extraordinary, unseen and individual exhibition stands realised in conventional fair construction. There is no limit to creativity. More than 100 ready-to-use Exhibition Stand Concepts, flexible, mobile concept lines: Exhibition Stands Folding Display, Exhibition Stands AluSystem and Expand Linkwall Exhibition Stands. Panoramic Exhibition Stands more than 100 ready-made Exhibition Stand Concepts, slim design, seamlessly branded, modular, smallest packing size, LED backlit. Concept lines: P-line, H-Line, C-Line and Lightbox. More than 500 promotional displays – Folding Displays, Roll-Up Displays, Event Equipment, Promotional Equipment and Exhibition Stands are waiting for you in our Online Shop. Based on your briefing, we will create for you an Exhibition Stand Concept, 3D Visualizations, Execution Plans, Detailed and Construction Plans and carry out the approval procedure. A good trade fair appearance does not have to be expensive. With our preconfigured exhibition stands, you will save a lot of time and effort and minimize the risk of failures. We will be happy to advise you and adapt our concepts to meet your needs so that you can inspire your customers to a maximum degree. In addition to the purchase of exhibition stands, we are pleased to offer you rental solutions as well. Naturally, we also offer you the conventional full service exhibiton stand construction. Concept, design, execution planning and implementation: you get everything from one source. Our designers and architects will develop the best cost-benefit ratio for you and recommend a system stand, an individual stand or a mixed construction. For consultation or individual custom-made products we are at your disposal: +49 (0) 69 150 49 3003.